The UCSD women’s basketball team had an extraordinary season, to say the least, capping off their 2015–16 campaign with an overall 26–5 record. It managed to earn a share of the California Collegiate Athletic Association regular season title and reached the CCAA conference semi-finals and NCAA West Regional quarter-finals. All-American senior forward Farrah Shokoor inspired the team with tremendous consistent play, averaging a double-double with 15.8 points and 11.8 rebounds. Equally impressively, NCAA West Regional All-Tournament Team senior guard Jamie Katuna averaged 18.3 points, 4.1 rebounds and 2.5 assists throughout the course of the season. The Tritons began the season brilliantly, with only two losses within the first ten games (8–2), coming from Cal State Dominguez Hills and the University of Alaska Anchorage. In particular, Dominguez Hills became a tough nemesis for UCSD, as both regular-season meetings ended in defeat for the Tritons. However, in no way, shape, or form did these defeats affect UCSD’s season. The start of the new year brought explosive offensive play from Katuna as she piled up career highs in points in consecutive games. 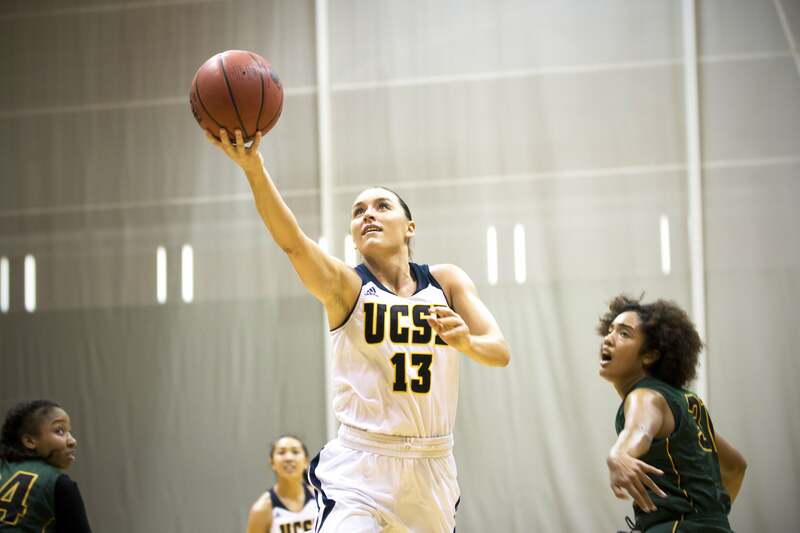 On January 1, the Tritons hosted Humboldt State, resulting in a 85–73 win for UCSD. The offense was led by Katuna as she, at that point in time, earned herself a career-high 29 points while shooting 50 percent from the field (10–20). In the second game of back-to-back night action for UCSD, the Tritons hosted Cal Poly Pomona. Katuna outdid her previous career-high points performance and decided to drop 36 points against Cal Poly Pomona, while adding seven assists. Sophomore guard Taylor Tanita also had herself a game as she contributed with her first double-double, 12 points and 10 assists. Nearing the midway point of the season, UCSD had been unstoppable at home, winning its first six games on home court. The Tritons’ first and only home loss during the season came at the hands of Cal State Dominguez Hills, where the Toros were able to put an end to the home undefeated streak in a 82–89 loss for the Tritons. Unfortunately, the loss came on Spirit Night, with 1,674 fans in attendance, which was easily the largest attendance number of the year for the women’s team. Due to a slow start trailing 0–12, the Tritons found themselves clawing back throughout. The early deficit simply was too much as Cal State Dominguez Hills played consistently from start to finish. Even behind the performances of trio Tanita (21 points), Katuna (18 points) and junior guard Beth Mounier (17 points), the Tritons were not able to keep their streak alive. Following the home loss, UCSD ended the remainder of the season on a nine-game win streak, sharing the regular season title with Cal State Dominguez Hills and Cal State East Bay due to all finishing with 18–2 conference records. Next up would be the conference tournament in which the Tritons faced Cal Poly Pomona during their quarter-final matchup. UCSD pulled off a 71–60 win against Cal Poly Pomona at home in the conference quarter-finals, and Katuna was once again the big contributor of the night. She provided the team with an outstanding 29-point performance, 19 of those points coming in the third quarter. The Tritons would face Cal State East Bay in the next round to attempt to earn a spot in the conference final. For the semi-finals, the Tritons traveled up north to Stockton, Calif. Unfortunately, the outcome was not in favor of UCSD in a narrow overtime loss, 77–79. Shokoor had the potential game-tying bucket as the buzzer went off but rimmed out. Katuna continued her run of outstanding performances and added another 30 point game while Shokoor contributed with a solid 26 points. The focus would then shift to the NCAA Tournament. In a rematch of the conference semi-final, the Tritons faced Cal State East Bay in the first round of the NCAA Tournament. This time around, the result would be much different, as UCSD exacted its revenge with a sound 15-point win, 74–59; Shokoor earned her 18th double-double of the year with 17 points and 14 rebounds. Next up would be a match with the host of the tournament, Azusa Pacific University. The Shokoor-led Tritons enjoyed a second-round victory at the expense of Azusa Pacific with the final score of 87–77, as Shokoor added one more double-double to her tally with 25 points and 10 rebounds. Katuna was no disappointment either, as she put up 22 points. Their tournament run was comfortable to that point. However, in the third round, they would be sea tested against the University of Alaska Anchorage Seawolves. The Tritons’ last meeting came early on in the season, in December, and resulted in one of the few losses they experienced throughout the season during a tightly contested 72–76 game. The third round result was no different as the fourth-ranked University of Alaska Anchorage ended the Tritons’ season in a 72–57 contest. Katuna led the Tritons with 20 points while teammates Mounier and junior forward Cassie MacLeod contributed with 14 points and 10 points. Next year, the Tritons will be without seniors Shokoor and Katuna, which leaves two big roles to be filled in place of the two West Regional All-Tournament team players. But, as seen throughout the season, UCSD has cultivated a highly competitive culture and will remain a top team.